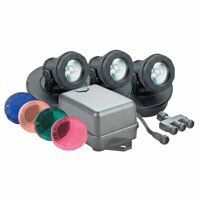 Decorative low-voltage halogen light can be placed underwater or along garden paths as walkway low voltage lighting. Single unit configuration with transformer and 4 interchangeable colored discs. Heat-proof glass lens. Waterproof seals for safe underwater operation. Complete with 12 volt transformer, listed to US and Canadian UL standards. Adjustable light with approximately 20ft of power cord. High brilliance 20 watt halogen bulbs. Limited 1 year warranty.